Brachiaria (Trin.) Griseb., Fl. Ross. 4(14): 469. 1853. Annuals or perennials; clums erect, ascending to creeping, sometimes floating; solid or hollow. Leaves hairy or glabrous; ligule very short, long-ciliate, or a fringe of hairs; blades linear to ovate-lanceolate, broad at base, with acute apex. Inflorescence composed of racemosely arranged spike-like racemes; main axis terminating in a raceme or in apical part with a few spikelets, racemes often secund, lower part sometimes shortly branched. 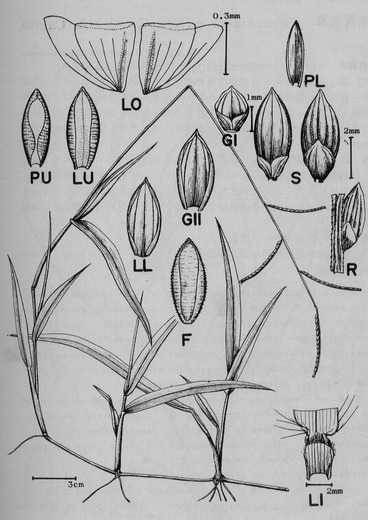 Spikelets falling as a whole, solitary in upper part of raceme, in lower part mostly in unequally pedicelate pairs; sometimes solitary (than in a biseriate raceme), but sometimes lower part in clusters of 3 or more, terete or dorsally compressed, oblong to ovate, 2-flowered; rachilla not produced; glumes and lower lemma herbaceous; lower glume nearly as long as spikelet or much shorter, opaque margins, slightly shorter than spikelet, smooth or finely tuberculate, mucronate or not; upper palea of same texture, embraced all around by margins of upper lemma; stamens 3; ovary glabrous, style 2, free, stigmas plumose, exerted laterally. About 100 species, distributed mainly in the tropical Old World, 4 species in Taiwan.